LEN - www.lankaenews.com | Russian mafia and ‘Gotler’ murder squad conspire : National security at stake ! Namal to be glorified through murders on Sept. 5 th . (Lanka e News -04.Sep.2018, 7.30AM) The murderous opposition which has a long experience in criminalities and had been demanding a ‘dead body’ from the good governance government over a long period has planned to take its revenge on the 5 th of September when it is staging its ‘people’s force’ protest , based on reports reaching Lanka e News inside information division. Godfathers behind this conspiracy are : a Russian mafia which enjoys Russian government patronage and the murder squad of local ‘Gotler’. The protest on 5 th September is aimed at diverting the bitter power struggle among the Rajapakses towards another direction , and is a drama to glorify notorious crook Namal Rajapakse the synthetic lawyer . In much the same way as the teachers of the book of Chinese forces are trying to exalt Gotabaya and make him a ‘king’ , the Russian mafia is maneuvering to decorate Namal as a ’king’ , which is by dumping the ill earned colossal illicit cash in that direction . 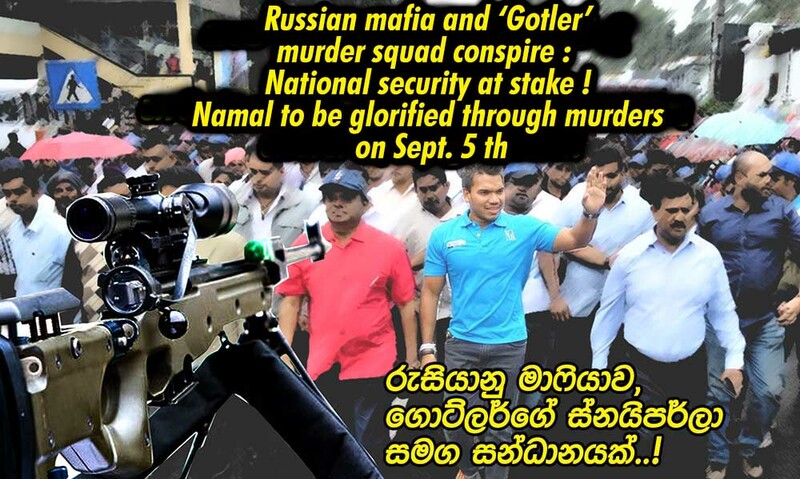 It is for this purpose Namal along with his younger brother Yoshitha (not the samanala malaya) the other jaltharaya (racketeer) toured Russia twice every month during the recent past . Information received by Lanka e News in connection with their conspiracy is as follows …. Another individual is to be enlisted to rob the bullet used in the shooting in order that in the subsequent investigations , the bullet cannot be found . Making use of the inability to search and find the bullet , it is to be publicized the government is suppressing the investigation into a homicide , and stage massive protests Island wide. This is the second part of their brutal power crazy conspiracy . Whether this conspiracy will involve the death of one , two or more victims has not been decided , it is learnt . In any event for the moment attention is being focused most sharply on the shooting and robbing the bullet . Though only the masterminds behind this conspiracy to murder ‘Hollywood style’ are aware , the responsibility without the knowledge of each other is delegated among various other individuals. Of course as a news website which stands by truth and fearlessly exposes any impending dangers to the people and the country , this is all we can highlight and spotlight in the best interests of Democracy and a Democratic government , and against murderous and terrorizing groups trying to capture power at any cost . All what we can say is , it is for the State intelligence Service to maintain a perfect surveillance operation and be most alert .